Saturday 7.19pm, I was preparing dinner in the kitchen; my wife was at her PC in the lounge yelled, "EARTHQUAKE!" One second later our house was shaking violently, it was like 5 full second... my wife was screaming and I was marveling how powerful that quake was! 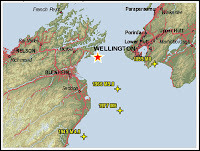 GeoNet inform me later it was of magnitude 5.7, 30 km east of Picton and 60 km deep. It was the second strongest one we felt since we are in NZ. 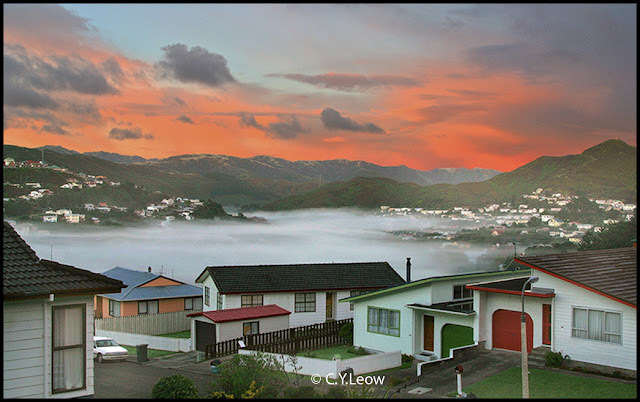 That is the main point of my story, how to buy a safer house in New Zealand! A question I have been asked many times by new immigrants and friends. The Pacific Ring of Fire (or just The Ring of Fire) is an area where large numbers of earthquakes and volcanic eruptions occur in the basin of the Pacific Ocean. In a 40,000 km (25,000 mi) horseshoe shape, it is associated with a nearly continuous series of oceanic trenches, volcanic arcs, and volcanic belts and/or plate movements. The Ring of Fire has 452 volcanoes and is home to over 75% of the world's active and dormant volcanoes. 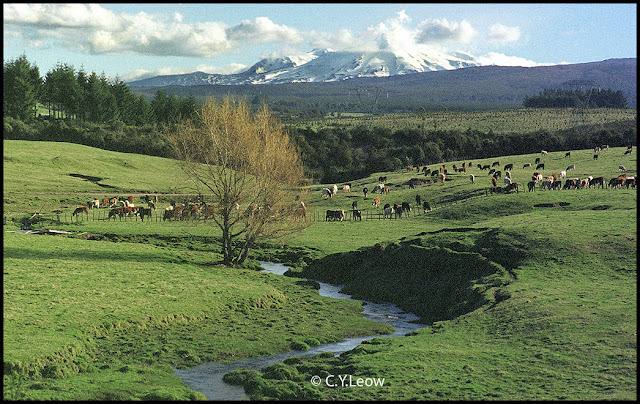 It is sometimes called the circum-Pacific belt or the circum-Pacific seismic belt. 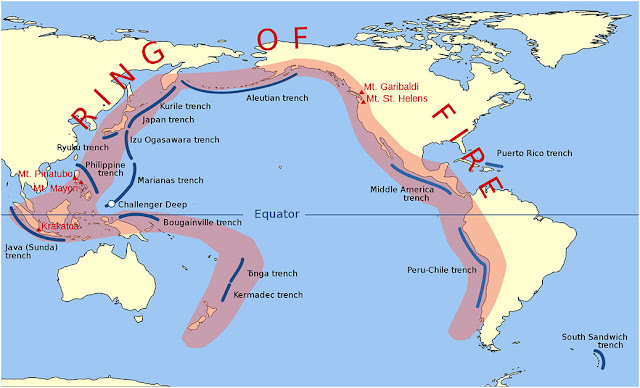 About 90% of the world's earthquakes and 89% of the world's largest earthquakes occur along the Ring of Fire. Earthquakes in New Zealand occur as the country forms part of the Pacific Ring of Fire, which is geologically active. About 20,000 earthquakes, most of them minor, are recorded each year. About 200 of these are strong enough to be felt. As a result, New Zealand has very stringent building regulations. 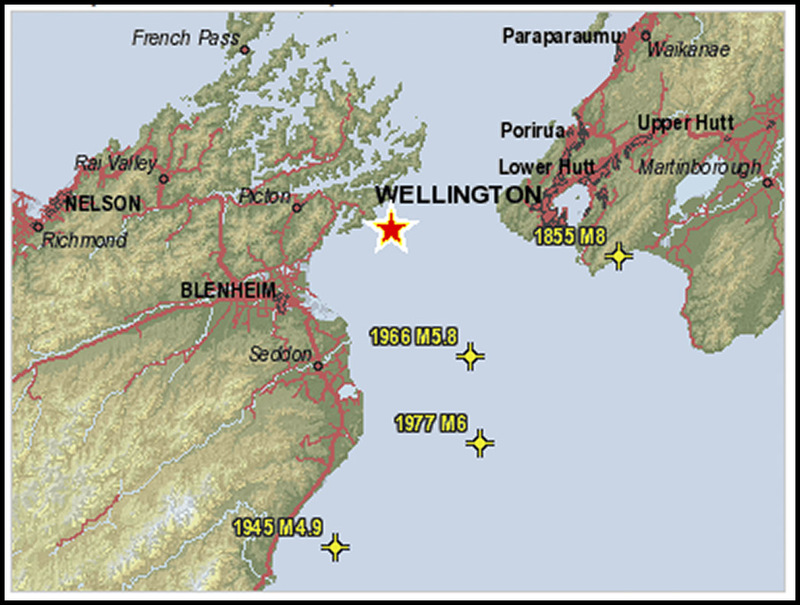 Please don't be paranoid about that 20,000 quakes a year, we have been in Wellington since 1988 and we only experienced half a dozen mild one and two really strong one. There were no property damages. 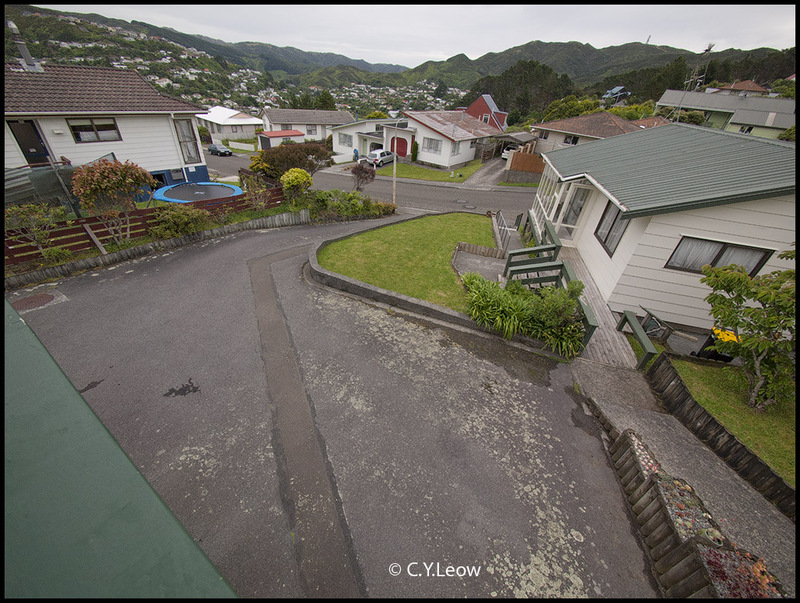 No doubt "New Zealand has very stringent building regulations", but there are also thousands of older houses that might not meet the earthquake regulations; put it this way, in an earthquake prone country like NZ, there are NO absolutely safe house; but with experience we can try and buy our-self a SAFER house! You probably came from a country that houses are built with bricks, after arriving in NZ I am sure you will notice the majority of buildings here are constructed with timber; for a good reason, during an earthquake; wood flexes and "move" with the shake and usually recover unscathed after the rock and roll is over. There are still plenty of older brick and mortar buildings in NZ, if you look at pictures of the Christchurch quake; I am sure you will notice most of the collapsed buildings were build with bricks. Our humble abode, a house constructed of solid pine. If the house came with a brick chimney on the roof, during a quake it can fall through the roof and cause extensive damage and injuries, even if it survive the shake; it might sustained hidden damage and become deadly! 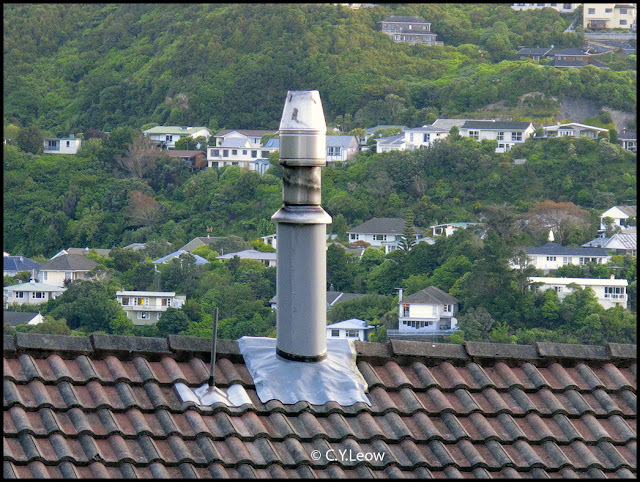 If you already bought the house, CHANGE THE CHIMNEY to a modern, light weight stainless steel type. Believe you me, it will cost you MORE money if the old brick chimney fall through your roof! A modern light weight chimney. Talking about roof... Most New Zealand tile roofs are made from either concrete (heavyweight) tiles or steel metal (lightweight). It is a no brainer which type will keep you and your family safer in an earthquake? A house with tiled roofing can have 2/3 of the total house weight on the roof, during a violent quake the falling crumpling tiles can bury you alive! After the Christchurch quakes, the Education Department has instructed ALL heavy TILED ROOFS of all the school to be replaced with the lightweight steel roof. 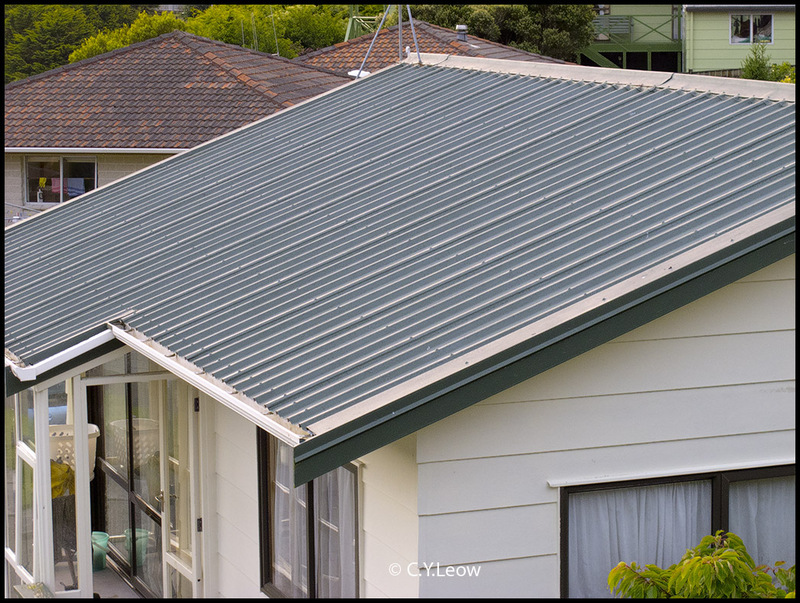 So please remember... a steel roof might not LOOK AS NICE as a tiled roof but it can save your life in an earthquake! Foreground, a house with steel roof and two houses of tiled roofs; background. 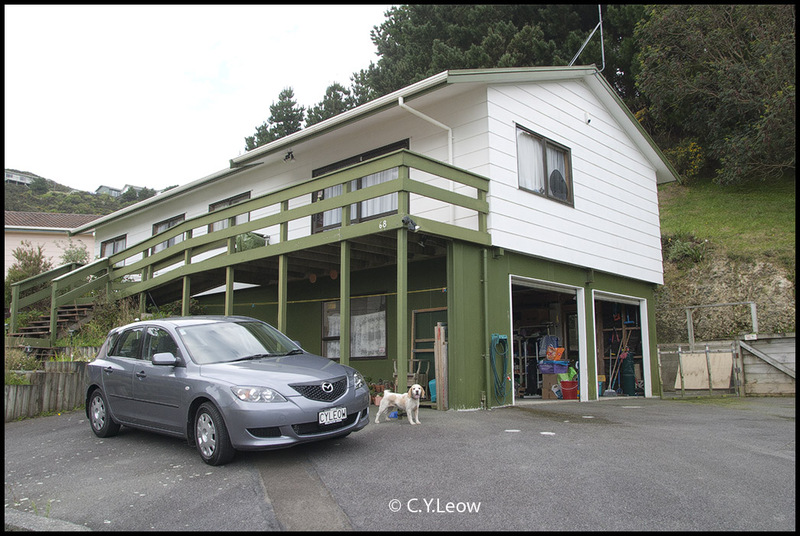 Looking at the picture of our house, you will notice that the building is "half sitting" on a double garage. 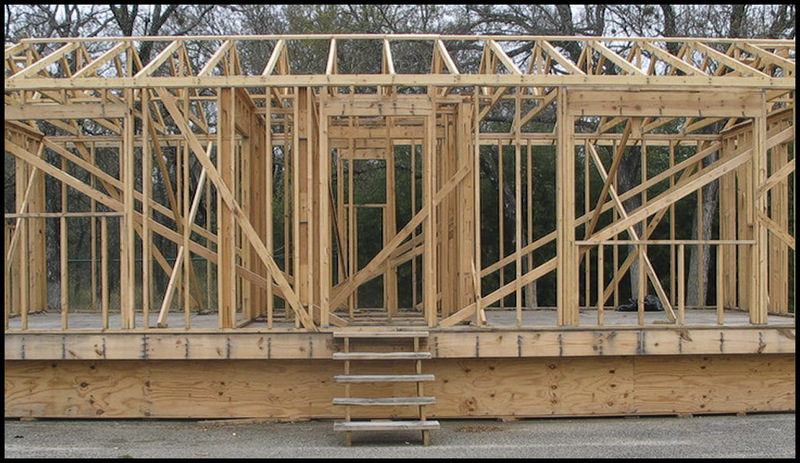 If you intended to buy a similar constructed house, take a good look in the garage; take notice if the garage wall which support half of the house are properly braced. Better still, they should be anchor bolt to the concrete floor. To increase support and prevent the house collapsing onto my parked Ferrari (kidding), a huge steel girder is used (see picture). 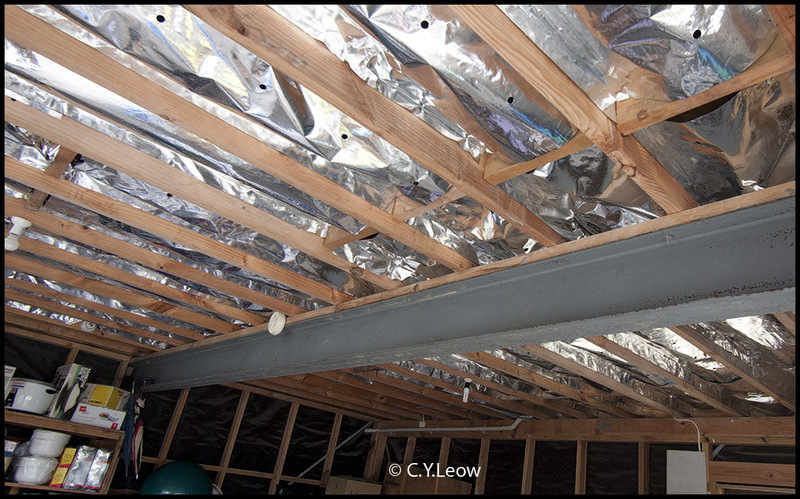 The steel girder inside the garage, giving extra support to the living room above. Most New Zealand house started with a wooden frame, walls are created by covering the frames with ply wood or GIB board, also known as plasterboard, wallboard or gypsum board is a panel made of gypsum plaster pressed between two thick sheets of paper. It is used to make interior walls and ceilings. Wooden frames of a new house. 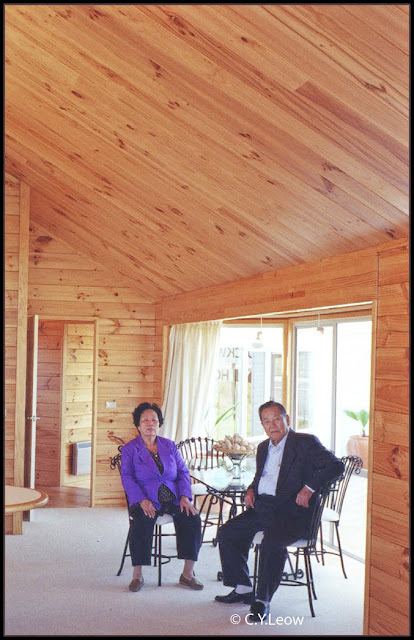 Many years ago, when my dear dad and mum were in NZ for a visits, I took them to look at some new houses being built, he examined the stucco cladding of the new houses and he was shocked at the "cheap way" they were made ;) "How can they last?" he gasped. Alas, that was long before we know about the LEAKY BUILDING fiasco and because of our shoddy building standard it cost the tax payer billions of dollars! 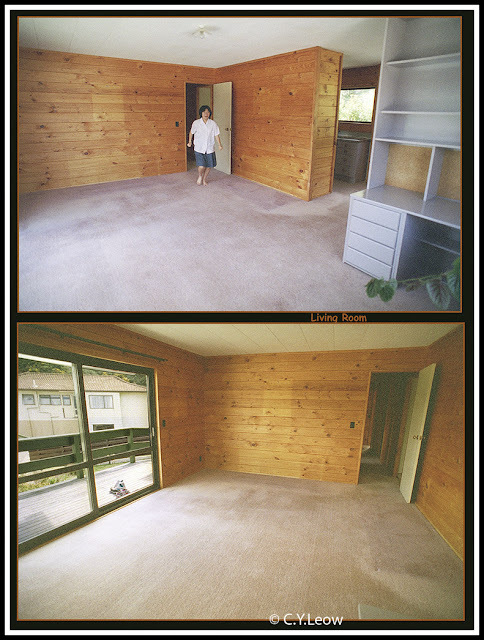 When we saw this house way back in 1996, I wanted it! I for one is a real sucker for house constructed of SOLID WOOD! 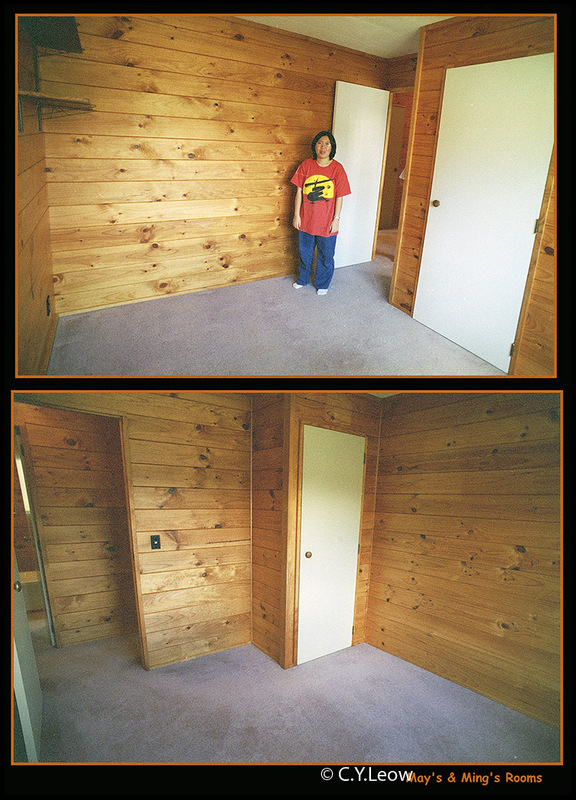 "The fundamental strengths of a Lockwood home are unique. Lockwood walls are locked together, not nailed together. This locking system, combined with the use of vertical tie rods in the walls is what gives it the strength to withstand earthquakes and hurricanes all over the world. The low maintenance qualities of Lockwood houses, the appealing designs and the ease and speed with which they can be built, makes Lockwood the perfect choice. Lovers of Lockwoods say they enjoy living in the natural timber home, and that they feel more relaxed, as though they are on holiday all year round. Some say they “feel healthier” and that their home is warmer and drier." There are other hidden hazards in Godzown! You are satisfied the house you love is pretty good in earthquake standard AND it is not a leaky building (you might need a qualified person to check), now please make sure the connecting water pipes in the house are NOT the black plastic type. 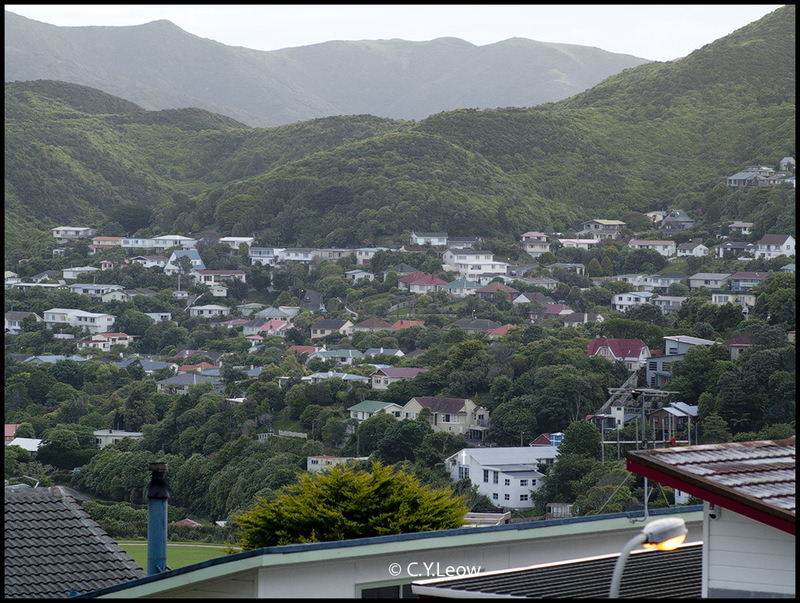 In 1988, when I was working as a Picture Editor at The Dominion; I can hear the police scanner at our crime desk; I had a cultural shock of the huge number of burgaries happening around Wellington everyday! A "Burglar Unfriendly" drive way sandwiched by neighbors. To prevent them carting your treasures away, you gotta think like them; they don't like to go into houses that have open space where your neighbors can see them. A long drive way they also hate, they can be seen walking out with your stuff! For newly arrived and new house owners, please make sure your property insurance consists of HOUSE insurance AND CONTENT insurance. In Asia, house insurance is but one insurance; I know of a friend who bought only the house insurance but not content and when his house was burnt down, the insurance company built another house on the land; but he did not get a cent for his treasures! Just replacing the carpets and curtains cost him thousands! It is also NOT a good idea to buy a property that sits on a fault line. You can check with the council where the fault line is in that area. Contractors and realtors should coordinate with local authorities for zoning and geo-hazard mapping. But as a responsible homeowner, we need to double-check which locations are suitable for building a house. After all, you wouldn't want to put your house in a place that has soft earth or is prone to flooding, right? You covered a lot here. I can say that prospective homeowners are becoming more vigilant when it comes to safety. If you are looking for a house and have the same concerns, this is something that you can openly talk about your realtor. Take note that your dream house is useless if you can’t sleep peacefully in it!